Dedicated to Sylvester Stallone. This just might be the most badass chicken I’ve ever drawn. Here are more gun-toting chickens. mmm, got me thinking that I should be Conandektrous: able to wield two Conan O’Brian’s at once! It’s all there! The bandanna, the abs, the stress marks and phonetic transcription… 🙂 Almost overkill, ehehe! 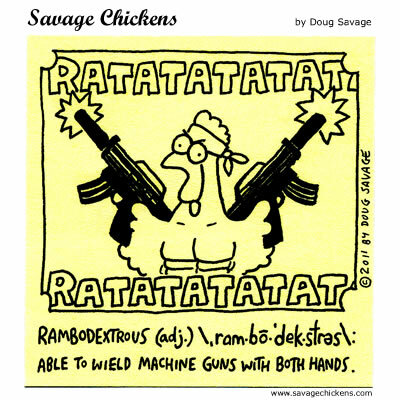 (When I win the lottery) I’m still hoping to get a Hummer with a gun turret… and now a life-size cut-out of Rambodexterous Chicken will have to be positioned in the hatch for said turret….